Every year the Parrish Art Museum invites over 350 students to participate in the Artist Residency, a series of museum-based workshops facilitated by exhibiting artists. 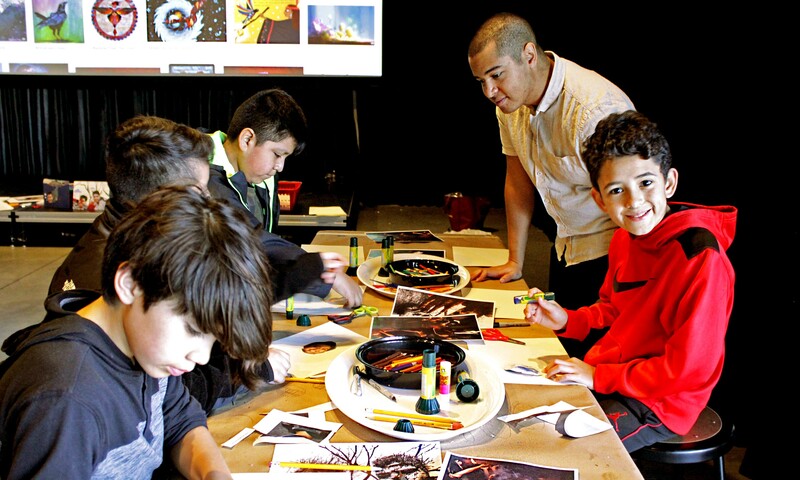 Supporting the Museum’s commitment to creating dynamic experiences for students, the residency fosters deeper connections with visual art and living artists through object-based learning and art making. Jeremy Dennis interacts with students during the 2018 residency program. Photo: Parrish Art Museum. In conjunction with the Museum’s exhibition Every Picture Tells a Story, the Parrish selected artist Jeremy Dennis to lead the 2018 residency program. Jeremy Dennis is an artist and photographer and a member of the Shinnecock Nation. His work is inspired by his family history and the history of the Shinnecock people, who have been based on the East End of Long Island for thousands of years. The residency activities focused on a selection of photographs and texts from his series Stories—Indigenous Oral Stories, Dreams and Myths, which he began in 2013. Inspired by indigenous legends, the artist creates supernatural photographic images that portray dramatic elements from the stories. Two images from this series, The Interment of Pogattacut and The Stone Coats, are on view in the Museum’s annual installation of the permanent collection. The series Stories includes legends, myths and historical accounts from a variety of Native American Nations. Dennis recreates the stories with digital photography by creating striking, elaborate, often dreamlike images. The theme of ‘transformation’ is central to many of the images and texts and was the focus of his work with students. Student work was displayed alongside Jeremy Dennis’ images and a video documenting the program during the Parrish Art Museum’s annual student exhibition, from February 10 through March 9 of 2019. Video documentation of the 2017 Artist Residency Mind Maps Project with Bastienne Schmidt.